Give me more what? Sensorial perceptions, heightened awareness, new stories, unexpected horizons . . . Give me more of my own reality and make me dream. That, in a nutshell, is what “augmented reality” is about and what the project currently under way at the EPFL+ECAL Lab sets out to demonstrate. “Give me more” demands a new exhibit in Renens. Researchers from Lausanne’s Federal Institute of Technology (EPFL) and designers from Lausanne’s University of Art and Design (ECAL) combine their creativity to kick-start innovation in new fields. Until 30 October, the current exhibit shows how imagination can give technology a boost and guide us towards uncharted territories, some of them surprisingly poetic. “The Lab’s purpose is to look at the technologies that are coming out of the EPFL, select those that are exactly at the right stage of development and propose them to designers to explore,” explains Nicolas Henchoz, director of the EPFL+ECAL Lab. As former head of communications of the EPFL’s hyperactive president, Patrick Aebischer, as well as a scientific journalist and image builder, Henchoz certainly has the tools for the job. “One of the most important principles is to find a technology that is ready, but not too far down the line,” adds Henchoz, “otherwise the result becomes too narrow, too aesthetic”. Augmented reality, or the ability to add new layers to awareness thanks to technological prowess, is the theme of the current exhibition, based on a technology developed by the Computer Vision Laboratory of the EPFL under the direction of professor Pascal Fua. Thanks to an algorithmic breakthrough by Vincent Lepetit and especially Julien Pilet, visual interactivity no longer resorts to visible tags and markers that slow the process down. Movements by on-lookers are transferred in real-time to images on any surface, including non-rigid ones. Because the technology runs on ordinary hardware (a webcam and a computer), its uses are infinite. So, where to begin? Enter Camille Scherrer, an ECAL student, who, for her diploma project, was exploring ways to add life to a printed page. She approached the CVLab. “It wasn’t easy at first, because we didn’t seem to be on the same wave-length. I was receiving all this information and didn’t really know what to do with it,” she admits. 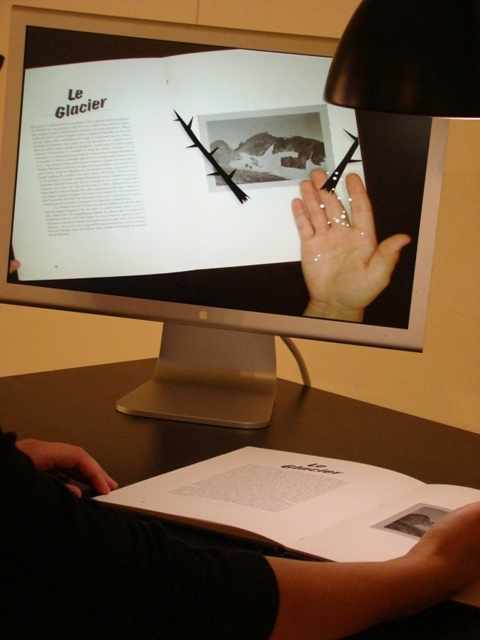 Scherrer brought a new angle to the research by integrating images of real life cut-outs to be superimposed on a book. The resulting Le monde des montagnes is a nostalgic photo album of her childhood pastures which earned the prestigious Best European Design Diploma / Pierre Bergé award. As the pages of the book are turned underneath a lamp, the reader activates a visual cascade of animals and plants that enliven the tale. Story telling will never be the same again. Titillation of a different kind is on offer with Cashback, the Dark Side of the Euro, one of the five other projects on display, also authored by Camille Scherrer with acolyte Vincent Jacquier. 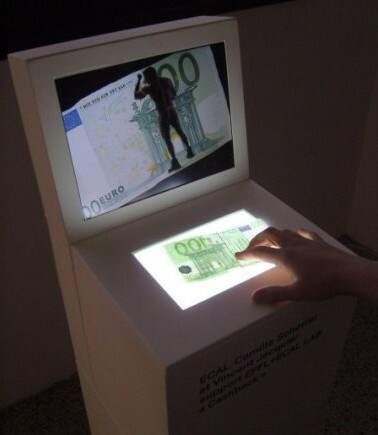 Place a bank note on a prepared flat surface and watch it come alive on a screen. Smaller denominations will get a suggestive leg unfolding from behind a building printed on the note, but big spenders get the Full Monty! And there is nothing make-believe about the gyrating pelvises of the strippers that are blazing a trail through your money. “Euro bills will never be the same way again,” suggests Henchoz, adding that augmented reality can provoke associations and has the power to “sell dreams”. Its marketing potential suddenly appears enormous. How messages that twirl around on T-shirts or clouds that dance off a sweep of a hand or foot (also projects on display) relate to our everyday lives remains to be explained. But as Nicolas Henchoz indicates, this is work in progress. The underlying purpose of Give Me More is to allow augmented reality to become accepted as a new, and useful, media. “Working with well-known people has allowed the lab to attract great talent. We are here to take risks and the students who work in the lab must always remain free, including to fail,” the lab’s director confides. But so far, things are looking pretty good. Dedicated to innovation and education, the EPFL+ECAL Lab was started only a couple of years ago when the ECAL, Lausanne’s University of Art and Design, was transferred in 2007 to a former hosiery factory transformed by Bernard Tschumi, the celebrity architect who was completing the Acropolis Museum in Athens at the same time.